Sunday, January 29th – HP Pavilion – San Jose, Calif.
Sunday was the final day at the 2012 Prudential U.S. Figure Skating Championships in San Jose, Calif. and Caydee Denney & John Coughlin and Jeremy Abbott were crowned U.S. champions in the pairs and in the men’s competition. Abbott entered the free skate on Sunday as the leader by more than seven points, and by the end, he had set a new U.S. men’s record as well as capturing his third gold medal. Abbott earned a record 183.35 points on his free skate for a total of 273.58 points. Abbott set new U.S. Championship records in both of his performances. Adam Rippon improved three spots above his previous best performance and finished second, while reigning bronze medalist Ross Miner earned his second straight medal of that color. The 2012 U.S. Championships have seen three new champions from 2011 as Meryl Davis & Charlie White won their fourth straight ice dancing title on Saturday and Ashley Wagner won her first U.S. ladies gold medal. For full event recaps, including results, stories, photo galleries and more, please visit icenetwork.com. 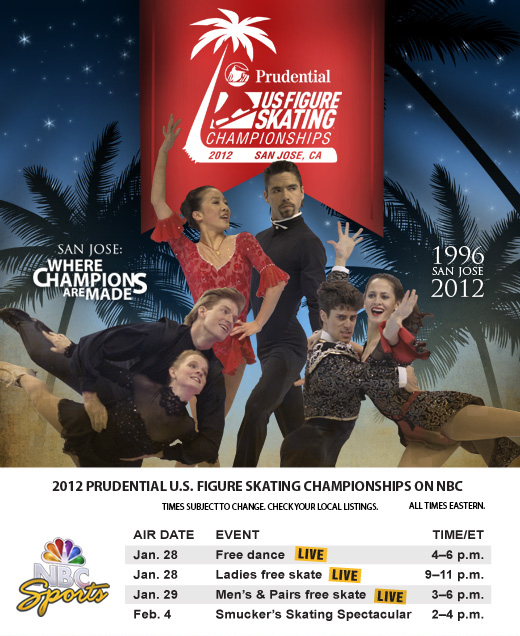 Introducing www.USFigureSkatingPhotos.com the official Web site to purchase photos of the 2012 Prudential U.S. Figure Skating Championships! In the days after the event ends, we’ll be filling the galleries with photos from each the short and free performances from your favorite athletes. Prints or specialty items such as a mug, puzzle or playing cards make a great gift to yourself or a loved one. Feel free to check out the site today and we’ll let you know when all the photos have been uploaded! Just Keep Winning – Meryl Davis & Charlie White won their fourth straight U.S. championship after posting personal best scores in all facets of the competition. Saturday, January 28th – HP Pavilion – San Jose, Calif. The Boys Who Score will again be in attendance today at the U.S. Figure Skating Championships. If you’re not familiar, Billy, Dave and Enrico are big figure skating fans who take the IJS judging system into their own hands. They attend many events, calculate their own scores and post these score from their seats as the actual scores are announced. Last night I ran into the guys at the Michelle Kwan Reception and they had, at the time, given the reception a solid 5.7 score, wisely using the old 6.0 system for Kwan. So if you’re in the arena, keep an eye out for The Boys Who Score, who have taken suggestions and are attempting to make their scores more visible to everyone in the arena than in the past. To learn more about their story, visit their Facebook page and follow them on Twitter. Last night, Michelle Kwan, the most decorated U.S. Figure Skating athlete, was inducted into the U.S. Figure Skating Hall of Fame. In a beautiful room, with Michelle’s signature lit up on the walls, the scene was set for an amazing night for one of the most well-respected and accomplished people not just in the sport of figure skating, but in the world of sport as a whole. The evening was started with U.S. Figure Skating Hall of Fame Chair of Electors, Dr. Lawrence Mondschein, speaking and saying his words about Kwan. He then introduced U.S. Figure Skating President Patricia St. Peter, who said Michelle is “the epitome of a champion on and off the ice.” St. Peter then went into a personal story about the 2005 U.S. Championships as a judge and why she pressed the 6.0 button after Kwan’s short program. St. Peter said, unlike anyone else, Michelle looked at you when she skated. Of the 6.0, St. Peter said, you only award if you don’t have to think about it, you just know. On that night, she knew. After President St. Peter spoke, a list of Kwan’s career achievements were read aloud, drawing laughs from the crowd because it began to grow comical how many awards she had won over her dazzling career. A tribute video was then shown, depicting Michelle in every aspect of her public life. Clips of Michelle on the ice as well as in pop culture and media were shown with great applause and many times laughter when a clip of a funny commercial or segment of a TV show was shown. After the video, Brian Boitano spoke about his and Michelle’s personal relationship. He spoke about her like she was a sister to him and that he thought to give her guidance many times, but that she didn’t need it, that Michelle was a natural. Boitano’s words were heart-felt and he recalled a story where the two were sitting alone together when Michelle told him that she wanted to be the President of the United States, which drew laughs and Michelle to point and jokingly scold him. Boitano continued his speech and then ended with, Vote Kwan for President. After a video submitted by Condoleezza Rice, congratulating Michelle on her induction, Kwan was officially inducted into the U.S. Figure Skating Hall of Fame. Kwan then took to the microphone and began by thanking the many people that have helped her throughout her career. She started with her family, then spent time to recognize many others individually. The largest cheers occurred when she thanked her many fans who have been with her throughout the years. Michelle said she always skated with her heart and that she is excited about starting a new life and that she would do everything in her new life the same way she skated, with her heart. After her speech, Michelle spent time greeting fans and taking pictures. There were 24 members of the U.S. Figure Skating Hall of Fame on hand who all took a picture with her on the stage. 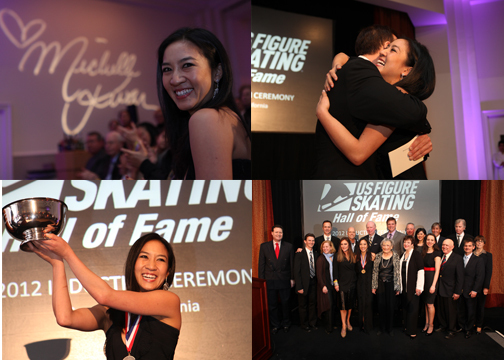 Overall, the night was befitting of the champion Michelle Kwan was and will continue to be. There has been no one else like her in the sport. Thanks to the help of Mondschein, St. Peter, Boitano, everyone who attended and everyone who put on the event, the night was befitting of the honoree. Friday, January 27th – HP Pavilion – San Jose, Calif.
Rusty, our in-stadium host, went to Downtown Ice in San Jose and put together this hilarious video! Wednesday, January 25th – HP Pavilion – San Jose, Calif.
Chen is Champ: Twelve-year-old Nathan Chen overcame a .05 deficit to claim the junior men’s title. From Second to First: Denney and Fraizer go from second to first in the junior pairs short after a scoring correction was made. Motoring into First: Aldridge and Eaton, who skate for Detroit SC, dance their way to first in the junior short. It was really fun. I had a good time out there and I thought it was one of my better skates. I’ve been watching lots of old skating phenomenons the past two days and I just noticed how much power and emotion and energy they put into their performances and I just wanted to try to see if I could have that kind of energy, so I tried to do it out there. At Lake Arrowhead, the training facilities are really nice. It’s way high up so it’s really good for stamina and then everybody there is very seriously into training so I see people doing triples and quads all the time so it motivates me a little bit. When I was much, much younger, I saw Evgeni Plushenko skate to The Godfather and I’ve always wanted to skate to that music so this year I figured I might was well give it a try. I really had a good time today. It was so much fun and I was so happy with my skate today. I didn’t see Nathan’s performance because he was right after me. I was just glad with how I skated and however it went was however it went. That will be absolutely amazing if I get picked for Junior Worlds. I would be so excited to do that and I would look forward to that immensely. I’ve thought about that. I don’t know we’ll see. I’ll have to see if I have any inspiration to write anything else because it did turn out really well and I’ll have to talk to my coaches and see for not next year. But if not next year, I probably will think about doing it again in the future. First, I’d like to thank the city of San Jose and everybody here for giving us this arena. It’s really nice. I had a great time showing my programs to all of you and I hope you all did [enjoy them]. I watched Nathan’s program and he’s a strong skater. He’s very consistent, but all four of us skated probably one of our better performances this season, so I’m just happy for everybody. Mostly I skate for the audience. I skate for the judges, but I think I do it mostly for the fans. My first coach Adam Dewewy inspired me to actually love the sport and love what I do and have a great time doing it. Tuesday, January 24th – HP Pavilion – San Jose, Calif.
First Medals Awarded – All four disciplines in the novice competition have ended and medals have been awarded. Competitors from California won three of the four gold medals. Few have racked up the amount of frequent flyer miles recently as Rachael and Michael Parsons. The 2011 novice champions flew to Innsbruck, Austria to participate in the first ever Youth Olympic Games and then straight back to compete in the 2012 Prudential U.S. Figure Skating Championships. “I had the time of my life, it was incredible,” Rachael Parsons added. Rachael and Michael, who call Rockville, Md. home, flew home and spent only one night in their own beds before flying out to San Jose, Calif. to compete in the U.S. Championships for the first time as juniors and as the reigning novice champions. The flight from Austria to Maryland was roughly eight hours, and the flight to San Jose was six hours, but according to Michael Parsons, he has no regrets. Rachael and Michael Parsons finished fourth in the Youth Olympic Games and they posted a score of 50.80 in their short dance at the U.S. Championships. They will be in the medal hunt in Wednesday’s free dance. Monday, January 23rd – HP Pavilion – San Jose, Calif.
Pairs greats Jenni Meno and Todd Sand won their third and final U.S.title together at HP Pavilion in 1996. On Monday night, they relived that magical feeling when their novice team of Chelsea Liu and Devin Perini captured the gold medal in the same building. “Our first national champions in the last place we won nationals. That’s pretty special, right?,” Meno said. Liu, 12, and Perini, 18, finished second in novice last year and climbed the final rung of the ladder to win the title. Liu, of course, wasn’t born when Meno and Sand won their titles and Perini was just 3. Still, they know all about the greatness of their coaches. “”They had quite a quality we look up to,” Perini said. For veteran coach Gilley Nicholson, Karen Chen’s U.S. novice title on Monday gave him his first national champion. Nicholson coaches the pre-teen sensation with Sherri Krahne-Thomas. Chen’s skating talent is remarkable, Nicholson said. Chen also received some valuable words of encouragement from Olympic champion Kristi Yamaguchi. Chen said she would like to someday qualify or the Olympics, have fun and make her career last as long as she can. Good morning again from San Jose, Calif.! We had an exciting day of competition on Sunday and we’ll crown our first U.S. champions today in all four novice disciplines. See the “Useful Links” area for everything you need to get caught up from the action yesterday and get prepared for today. Mill^2 at the Top: Whitney Miller and Kyle MacMillan lead after day one of novice ice dancing. There’s No Place Like Home: California residents Vincent Zhou and Karen Chen lead the novice singles competitions. While fellow Californians Chelsea Liu and Devin Perini lead the novice pairs competition. Dolensky Does It: Timothy Dolensky holds a narrow lead while skating to music he composed in the junior men’s competition. Figure skating fans, I know what it’s like. As a fan of the English Premier League, more specifically Arsenal Football Club, most of my memories of games being won and goals being scored have occurred while watching on my laptop or alone. But, my friends, there’s a better way. Through many of the early years of watching soccer at odd times, like many of you do following the international sport of figure skating, I found it difficult to find high-quality sites online to watch where I could pay a flat fee and receive most of the games I was interested in. Additionally, when I was able to watch online, I was typically crammed on the couch with my headphones on, watching by myself when I would have loved to stretch out and watch on my TV. Fret not, fans of figure skating, I have the answer for you. Again, as someone who struggled to find the games I wanted to watch, it’s nice that icenetwork.com has the events you’re interested in one spot for a flat fee for the entire year. Additionally, there are many different ways to hook your laptop computer to your television for comfortable and convenient viewing. Some good advice is to write down what kind of computer you have and what type of laptop you own and take that information with you to your nearest electronics store. There, someone will be able to help you pick out a cord to connect the two and watch all of your figure skating, or whatever else it is you typically view on your computer, on your television just like it was on TV. If you’re looking for a way to further enjoy your viewing experience, give it a shot. If you need more help, feel free to email me at jellis@usfigureskating.com and I’d be happy to make some suggestions! I have long struggled, but have seen the light at the end of the living room, my TV, hooked up to my computer. Hope this idea helps!